Three Days on the White Mountains, by Dr. Benjamin L. Ball, 1856, 2002 reprint. 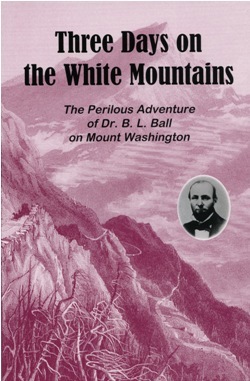 Dr. Ball endured one of the earliest survival epics on Mt. Washington in October, 1855, and published an account of his three-day misadventure the next year. This new reprint brings back an old classic that has long been available only to serious White Mountain collectors. 70 pp, 5 1/2" x 8 1/4".